A 76 page biography featuring colour illustrations of Laugé's work and photographs of the artist and his friends. It is with pleasure that I present this book which constitutes an opportunity for our English speaking friends. 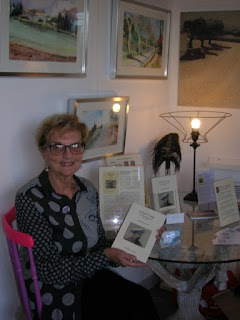 The author Barbara Dordi, poet and presenter of writing workshops, and a relatively new inhabitant of Cailhau, was truly moved by the paintings of Achilles Laugé during the 2009 exhibitions of his work. She began to gather information about the painter from documentation available and patiently summarized chronologically all that constitues the life and work of my great-grandfather Achille Laugé. 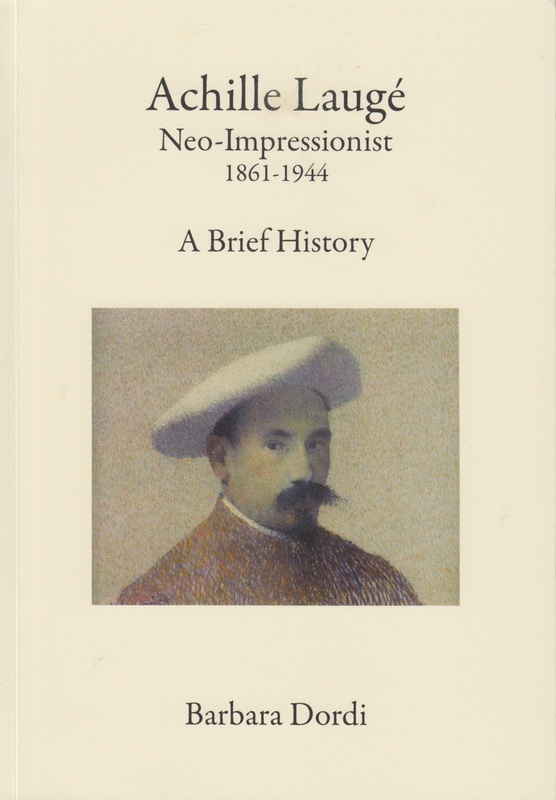 Given the growing number of English speaking newcomers to this area, it is evident that this book will be a very favourable means for them to be better acquainted with the Post-Impressionist painter Achille Laugé. It is likely that many readers will want to come Cailhau to discover the Achille Laugé circuit where they can enjoy some of the scenery celebrating the Languedocian light that the Master captured so often. Happy reading, and I thank Barbara Dordi for her work which highlights the work of Achille Laugé. 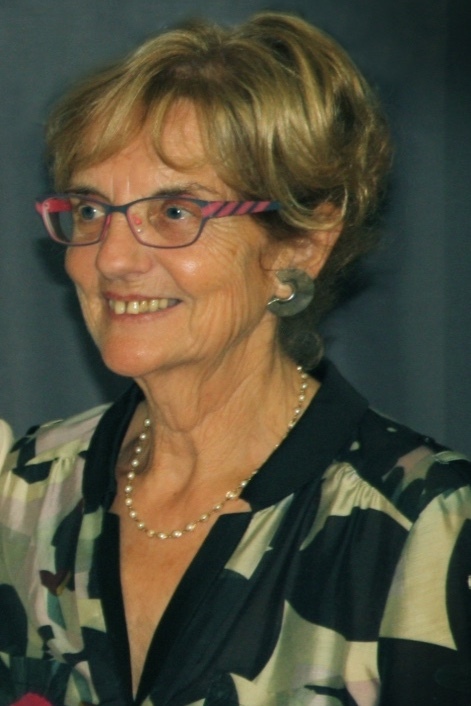 Barbara Dordi, poet and editor. Lors du premier marché de l'Art, qui s'est déroulé dans le village, nous avions rencontré Barbara et Russi Dordi, époux dans la vie, ayant des points communs dans la poésie, la peinture… Elle, est née dans le nord de l'Angleterre, a enseigné la littérature anglaise et entrepris des études de théâtre dans les écoles et universités du Kent avant de prendre sa retraite et se consacrer à sa propre écriture. En 1995, avec son époux, Russi, ils se promènent sur le Saxon Shoreway et pendant 6 mois, ils organisent des expositions aux galeries de la bibliothèque du Kent pour lancer « Saxons in the Garden », un livre de poésies de Barbara, illustré par Russi. 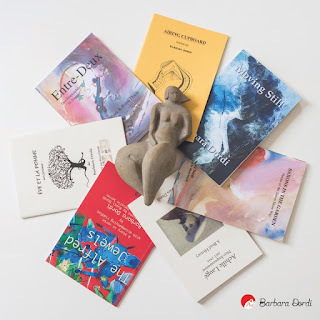 Depuis 1999, elle a édité Equinox, magazine de poésies et depuis, encore, cinq livres tous illustrés par son mari. Elle a obtenu des récompenses pour ses œuvres qui ont été imprimées dans plusieurs journaux et magazines. Elle fait des sculptures en céramique. En 2001, ils ont acheté une maison en France qu'ils ont restaurée. Ils ont vécu à Alaigne et sont maintenant à Cailhau. Lui, Russi vient de Bombay, Inde, et a émigré en 1955 en Angleterre. Il a enseigné l'art et la poterie dans les écoles et établissements pour adultes. Depuis sa retraite, il peint à plein temps de l'art abstrait, dessine des paysages et/ou formes humaines dues à son inspiration. Ses œuvres destinées à des collections privées, ont été exposées dans le monde entier. Actuellement, elles sont dans la Galery Castle Arts de Canterbury, mais aussi à Whistable et Londres. Il est membre de la Société des Arts du Kent et de la Société. Nationale. Tous deux font des expositions pour lancer « Saxon in the Garden ». En 1999, ils ont gagné des prix adultes peintures et poésies combinées. Le mot de la fin : « Nous créons ensemble de nouvelles œuvres inspirées par notre amour de la France. Nous avons exposé à Mirepoix, Belvèze, Amaign, Peyrefitte… » Un autre point commun : le chant puisqu'ils font partie de la chorale d'Alaigne. Will the writer/translator who sent a copy by email of his article 'Mon Beau Paris' please contact The French Literary Review. Your email address, together with many more has been inadvertently deleted from the Review's account. On Saturday 7th November I am launching my new book ‘Achille Laugé Neo-Impressionist’ - a biography of the 19th century Cailhau artist. The book has 20 illustrations in colour and black and white and has a Foreword by the painter’s great-granddaughter Anny Laugé. The launch will be held at the Forgerie Gallery in Alaigne between 4pm and 7pm. Refreshments will be served by Lin the gallery curator who has quite a reputation for her hospitality on these occasions. The gallery is on your left as you enter Alaigne from Limoux - it is attached to the Chambres d’hôtes ‘Chez Dyna’ which you will see after you pass the Mairie. There are many other interesting things for sale in the gallery - a good place to buy Christmas presents and cards at very reasonable prices. 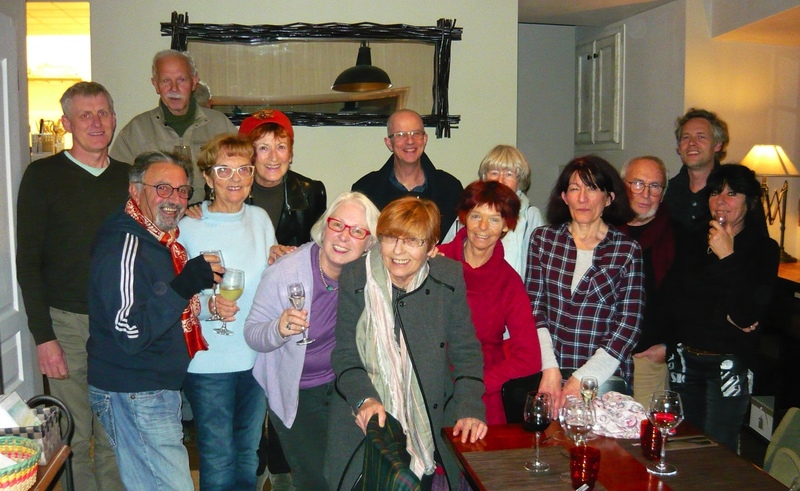 feast of nibbles, wine, Blanquette etc. Un grand merci à mes amis les cailhautais et cailhautaises qui sont venus ! 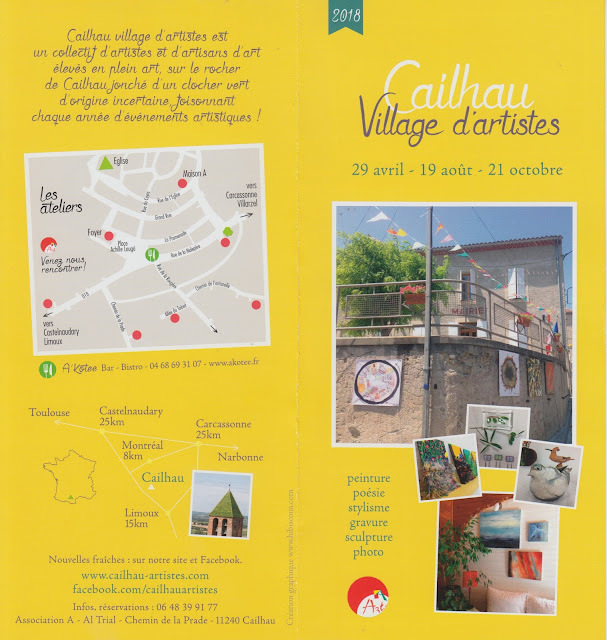 In south-west France near Carcassonne in the Aude, a small village calls itself ‘Cailhau village d’Artistes’. Cailhau’s first artist was Achille Laugé. His Pointillist style paintings and drawings disconcerted the locals in the late 19th/early 20th century. He chose to live his life with his own people, and they as well as the Salons in Paris didn’t accept him. 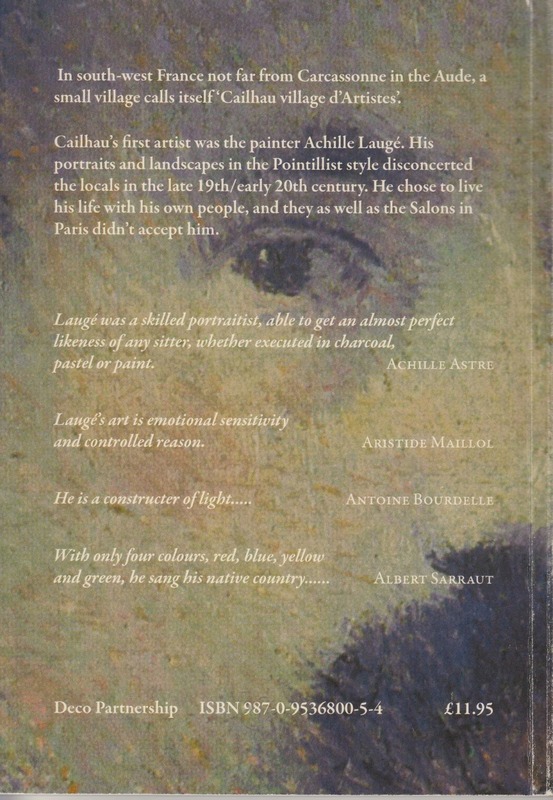 ‘Laugé was a skilled portraitist, able to achieve an almost perfect likeness of any sitter, whether executed in charcoal, pastel or paint….’Achille Astre - The Achille Astre Gallery, Paris. ‘Laugé’s art is emotional sensitivity and controlled reason.’ - Aristide Maillol, Painter and Sculptor. ‘He is a constructer of light’ - Antoine Bourdell - sculptor & painter.‘With only four colours, red, blue, yellow and green, he sang his native country’ - Albert Sarraut - twice prime minister of France. The friends he studied with at the École des Beaux -Arts in Paris - sculptors Antoine Bourdelle and Aristide Maillol each went on to achieve fame during his lifetime. Laugé’s relative isolation in the Languedoc-Roussillon meant that his work remained largely unknown to most French scholars, critics and collectors of his time. Now the art world has woken up to the talent of this recluse - his time, as his friend Antoine Bourdelle predicted years ago, has come at last. Today, paintings by Laugé hang in the Musée National d’Art Moderne in Paris alongside Neo-Impressionist works by Seurat and Signac. Laugé’s paintings have found a home not only in musées in France but in collections throughout the world. 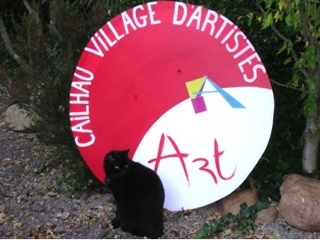 The author Barbara Dordi, poet, editor and presenter of writing workshops, and a new inhabitant of Cailhau, was moved by the paintings of Achille Laugé during the 2009 exhibitions of his work. She began to gather information about the painter from documentation available and patiently summarized all that constitutes the life and work of my great-grandfather Achille Laugé. Given the growing number of English speaking newcomers to this area, it is evident that this book will be a very favourable means for them to be better acquainted with the Impressionist painter Achille Laugé. It is likely that many readers will want to come to Cailhau to discover the Achille Laugé circuit where they can enjoy some of the scenery celebrating the Languedocian light that the Master captured so often. I thank Barbara Dordi for her work which highlights the work of Achille Laugé. Happy reading. 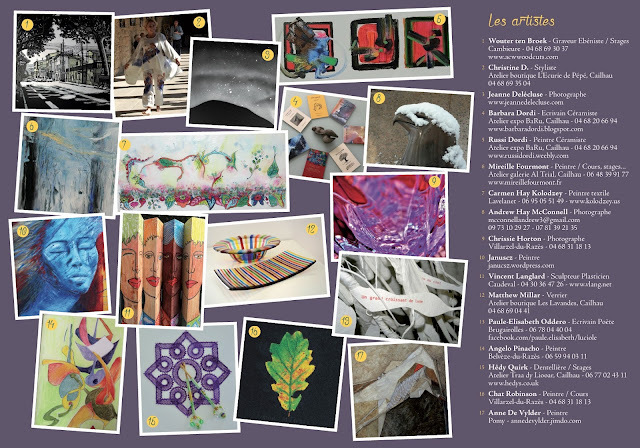 I am very honoured to be included in this wonderful anthology published October 2014. £12.99 - clothbound hardback 384pp. 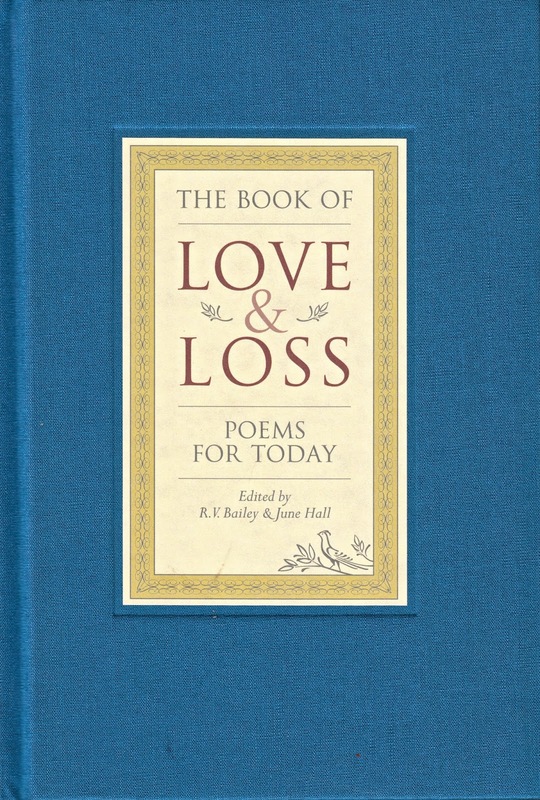 Nearly 400 new and contemporary poems on celebration and mourning, hope and despair, which will touch the hearts of all. Less familiar voices are here along with laureates and many well-loved poets, including: Gillian Clarke, Carol Ann Duffy, UA Fanthorpe, Philip Gross, Jackie Kay, Andrew Motion, Mario Petrucci and Penelope Shuttle.